DALLAS, Texas – The Canadian ELD mandate is fast coming down the pike, and one area where it could differ from the U.S. rule may impact carriers and device manufacturers south of the border. 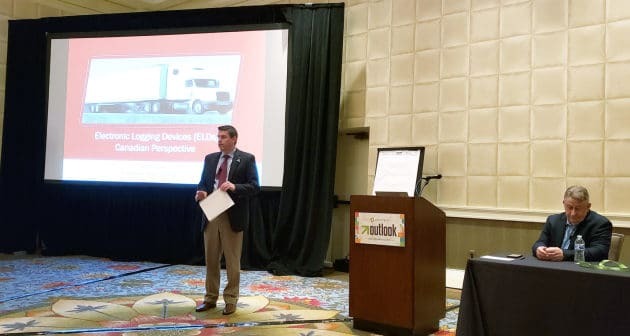 Providing an ELD update during the Omnitracs Outlook User Conference in Dallas today, Canadian Trucking Alliance (CTA) senior vice-president of products Geoff Wood highlighted some updated positions his organization submitted to the government last fall. One such change is to implement third-party certification for ELD devices used in the Canadian market. ELDs in the U.S. are self-certified, a position the CTA echoed in its initial ELD recommendations, but have since reconsidered. Wood said the reasons for the change in position is to make sure carriers and commercial vehicle enforcement officers are working with a product they know is a legit device. He also said third-party certification will eliminate devices that can be manipulated. Wood said the insurance sector had voiced concern over scenarios where ELD devices had been manufactured in a way fleets were able to manipulate the HOS data, and were being used as a recruitment tool. If ELDs used in Canada require third-party certification, it would mean U.S. carriers operating north of the border would need to ensure their ELD provider received appropriate certification for it to be legal in Canada. Wood added that if the third-party certification recommendation comes to fruition, it could add to the timeframe of a Canadian ELD mandate, but not significantly. The CTA is hopeful the ELD mandate will come into effect this June prior to the fall federal election. Wood underscored that the Canadian ELD mandate is intended to mirror the U.S. rule as much as possible to ensure a smooth transition. Geoff Wood speaks during the Omnitracs Outlook User Conference in Dallas, Feb. 26. U.S. carriers currently using an ELD and complying with Canadian laws would continue business as usual, said Wood. Thomas Cuthbertson, vice-president of regulatory compliance with Omnitracs, said his company’s comments regarding the Canadian ELD mandate “were all about getting harmonization” between the U.S. and Canada. Cuthbertson said the more harmonization the two countries have with ELDs, the easier the transition and implementation will be. Despite the fact that the U.S. has had an ELD regulation in place for some time, and the mandate’s grandfather clause is about to expire this December, carriers are lagging when it comes to making the transition from AOBRDs to ELDs. Staring this December, carriers relying on the legal use of AOBRDs will need to changeover to ELDs, but according to Fabian Arroyo, senior manager of technical training for Omnitracs, only around 10% have made the switch. “If we haven’t scared you enough, we’re going to scare you even more…you need to start thinking about transitioning today,” Arroyo urged a room full of session attendees, most of whom have not adopted ELDs. Arroyo said depending on the size of a company’s fleet, changing to ELDs could take days, weeks, or even months to complete, and it is vital to have an immediate plan. The hardest part of making the adjustment to ELDs, according to Arroyo, is training drivers how to properly use the device. As of today, there are 297 working days remaining before the AOBRD grandfather clause expires in the U.S. The same rule will apply for Canadian carriers operating south of the border. From a company standpoint, Omnitracs CEO Ray Greer told Truck News-West they are still trying to understand what the ELD mandate in Canada will look like. “(We’re) trying to make it as compatible with the U.S.’s as possible, so we’re waiting to understand it all so we can scope it,” said Greer. With Canada making up about 10% market share for Omnitracs in comparison to the U.S., Greer said there is a myriad of devices being sold north of the border. Greer said based on where Omnitracs is currently at in Canada, there may be some devices they could upgrade to make the transition easier for both the company and its northern customers. Make elds all the same .canada has 13 hrs driving. That is a good time frame. On average not everyone will fully run 13 hrs. But it gives extra time to relax on your trip. speaking from experience meaning 38 year’s of experience driving over the road. ELD’S are the solution to SAFETY. The whole problem is the people being hired to drive these truck’s today. Too many of the driver’s have the totally wrong work ethic’s.,And have no respect for the human race. I would estimate that close to 50% are not qualified to be behind the wheel of an 18 wheel truck., and this will not change with any ELD device. The total blame is on the companies who allow these people to drive their truck’s & cause many accident’s that should have been avoidable. And then to the insurance companies who are allowing these companies to operate. THIS IS THE CLEAR ANSWER TO THE PROBLEM’S ON THE ROAD’S THAT WE ALL SHARE !